This week, Restorsea is featured on FashionMeGreen.com! 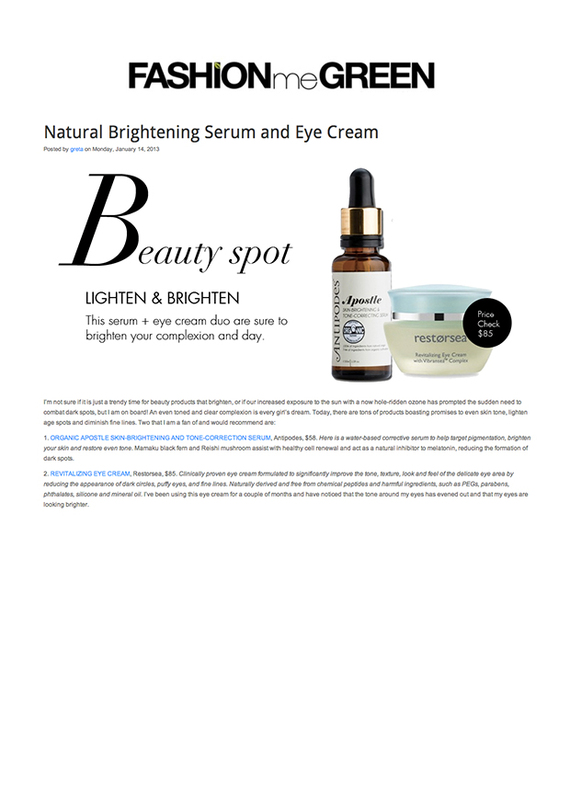 Our eye cream is recommended for its effectiveness and all-natural ingredients in an article titled, "Natural Brightening Serum and Eye Cream". Greta Eagan of FashionMeGreen.com says: "I’ve been using this eye cream for a couple of months and have noticed that the tone around my eyes has evened out and that my eyes are looking brighter." FashionMeGreen.com is a resource for eco-styling (both personal and editorial), personal shopping, eco-city tours, beauty and style consultations, and daily eco-luxe living tips.